If I break this project down into Phases, then this post definitely closes off Phase 1 - the first seven of my fourteen tiles upper surfaces are now complete. 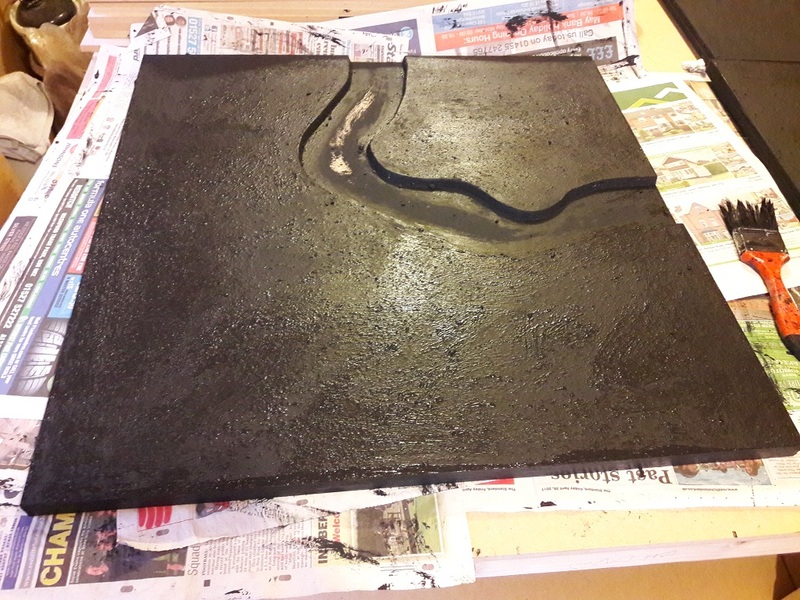 I have seven more tiles to build and paint (five of which will just be "flatties", one will be a river section and one will contain a pond). 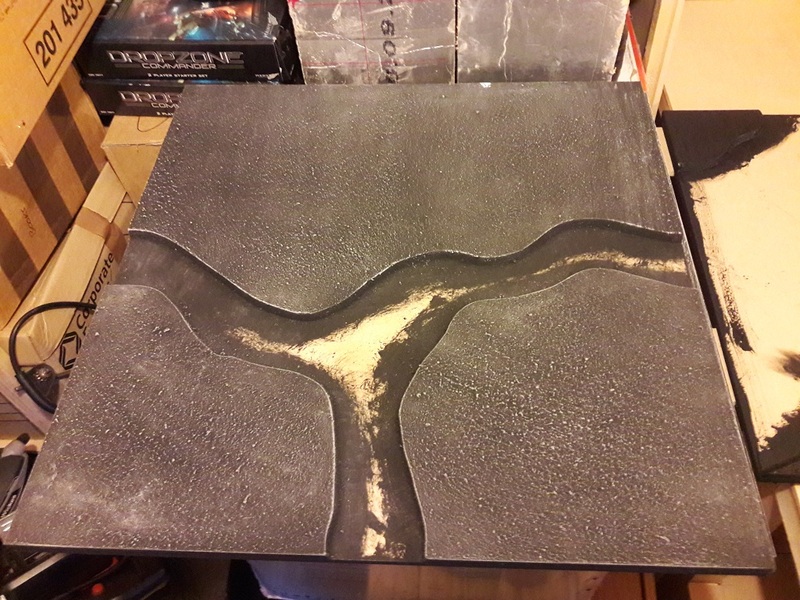 In addition, all fourteen tiles will be flipped over and given a different finish on the other side so that I can use more than one basing scheme for games that aren't fantasy/sci-fi based. A set of rocky details (fords etc.) has been built using PVA glue and fish-tank pebbles. 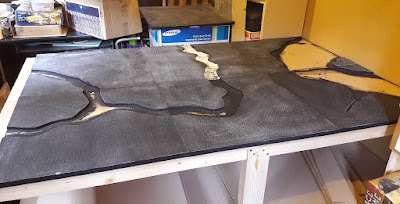 The river itself is sculpted (not very well!) 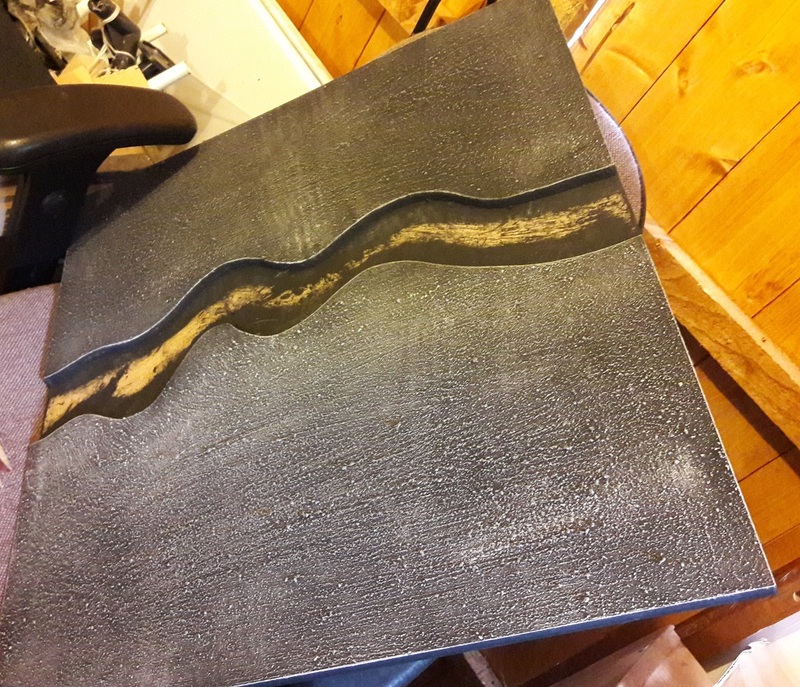 from decorator's caulk and has been basecoated brown. 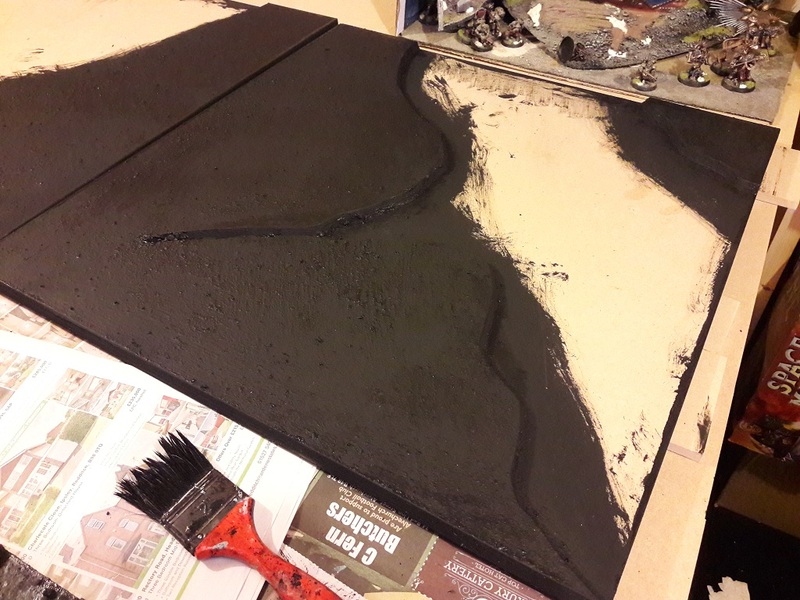 In this image the rocky details have been painted black, ready for some highlighting. 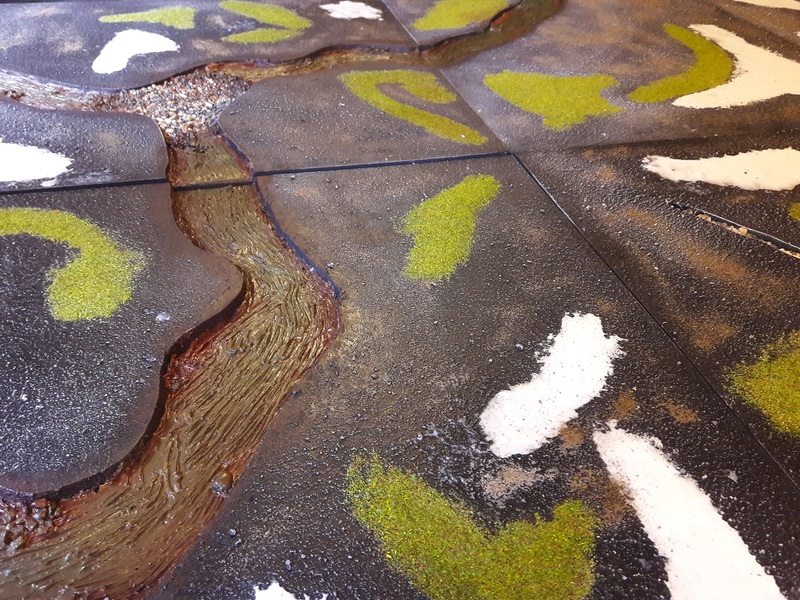 The river sections have had some green added to suggest dirty, murky water. 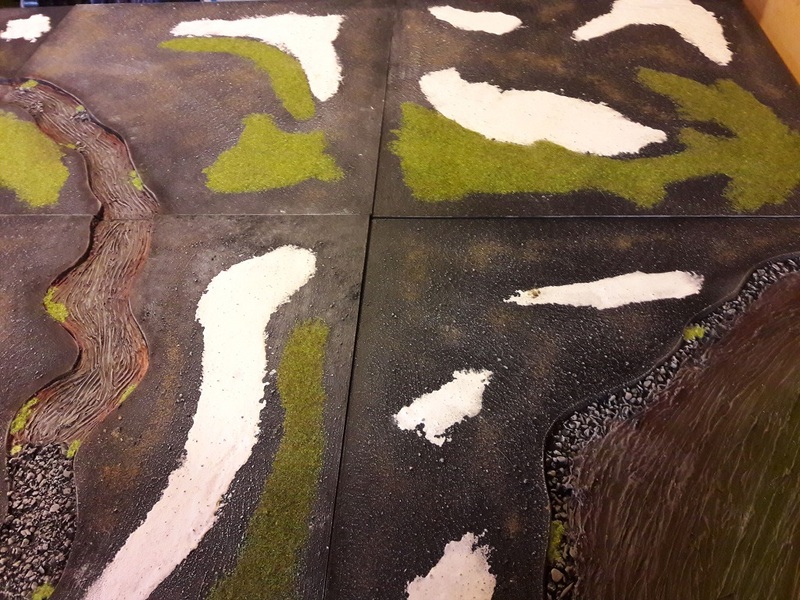 Here the rivers and rocks have been finished with a drybrush of light grey. Some tufts of static grass have been applied to portions of the riverbank too. 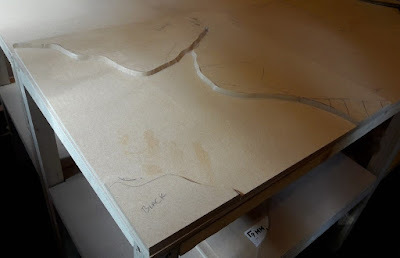 So, time to put these away, get the jigsaw back out and get started on the second batch! 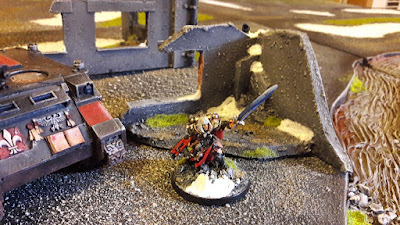 Wow - I can't believe it was March when I painted my first SoB model (a Rhino, pictured below). 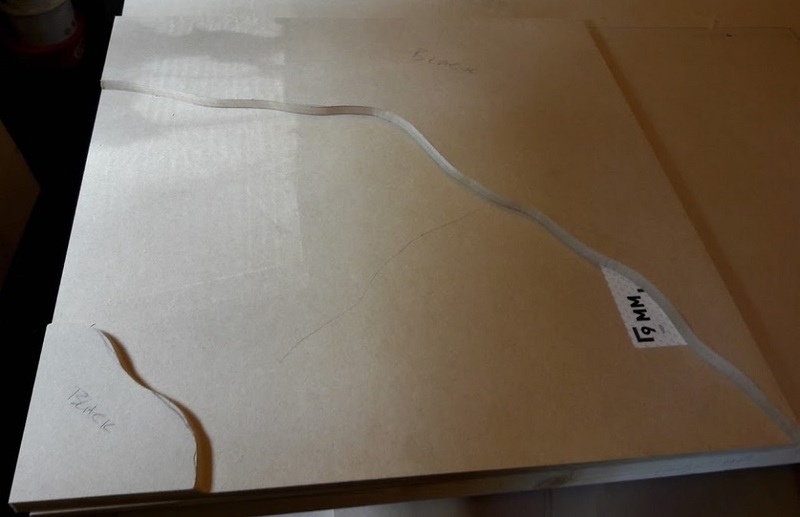 This is only the second model! That's not a great rate of progress by any standard! 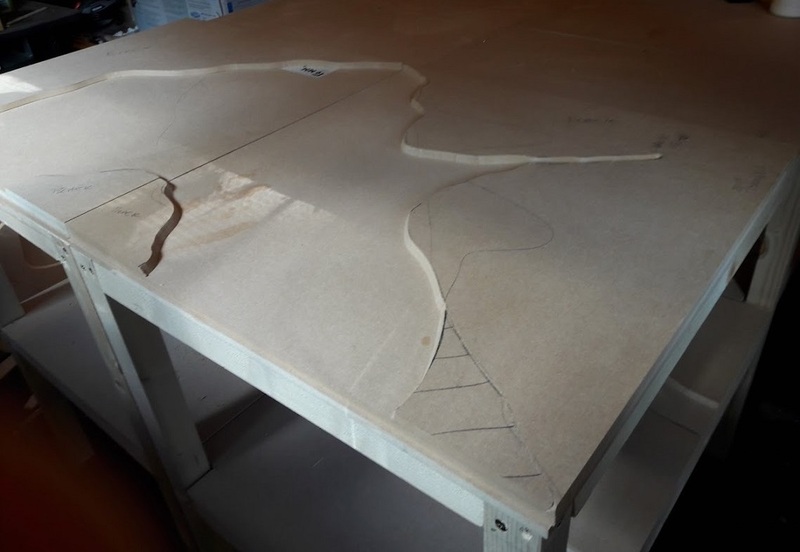 Mind you, I have been busy with other projects so I won't beat myself up too much. Anyway - here she is. She's actually a Sister Superior model on a larger base, but I think she works OK.
As always, leaping back and forth between projects. 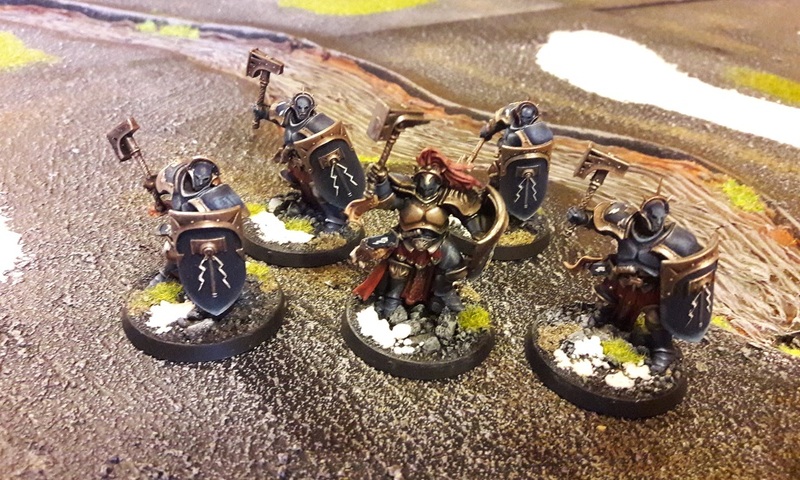 Many weeks ago I wrote a post showing what was next in line for my slowly growing Stormcast force. I've finally got some actual paint down and am able to share with you the results. Of course those horrible GW types have gone and released Soul Wars since so my army (and therefore to-do list) is about to get a lot bigger. 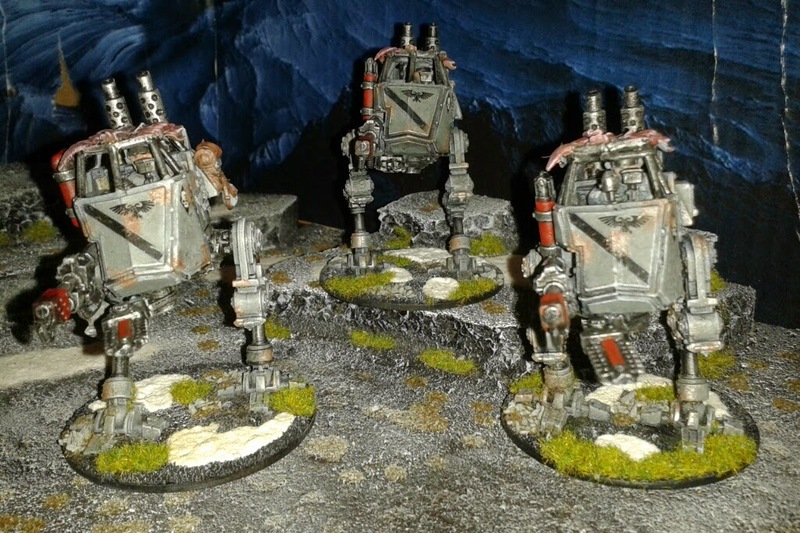 I've actually completed two more units - these guys and some Vanguard Hunters who I will share in a following post. 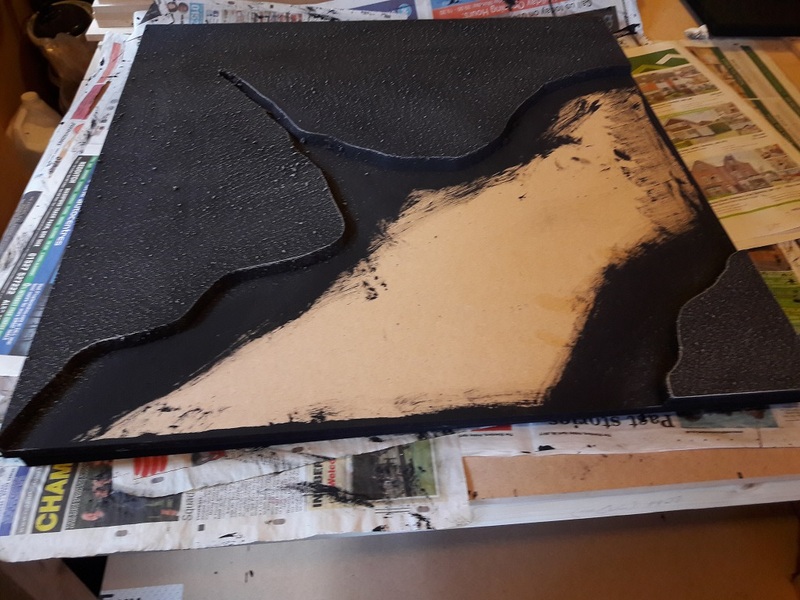 So at this point I have seven tiles cut, assembled and textured with gritty black paint. Time to start bringing them into line with my models' basing scheme. As you can see the scheme is basically an ash-waste, with some scrubby grass and patches of snow. My son Noah - my most valued assistant on this project. 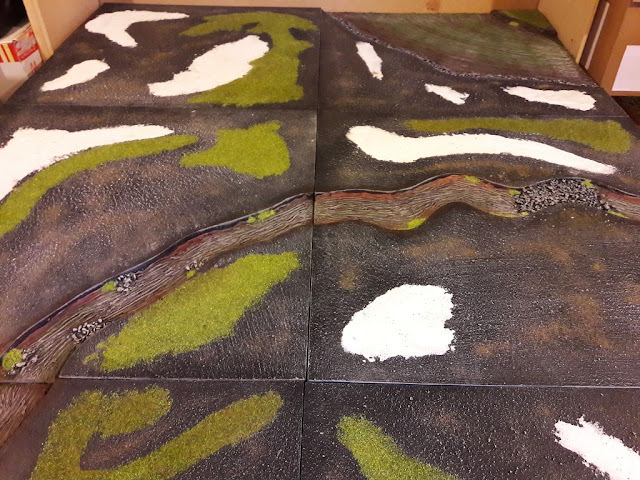 Shown here in a drybrushing frenzy! Once all the drybrushing was completed, we painted on some patches of PVA and added grass patches (a 50-50 mixture of Javis "spring" flock and "summer" static grass). 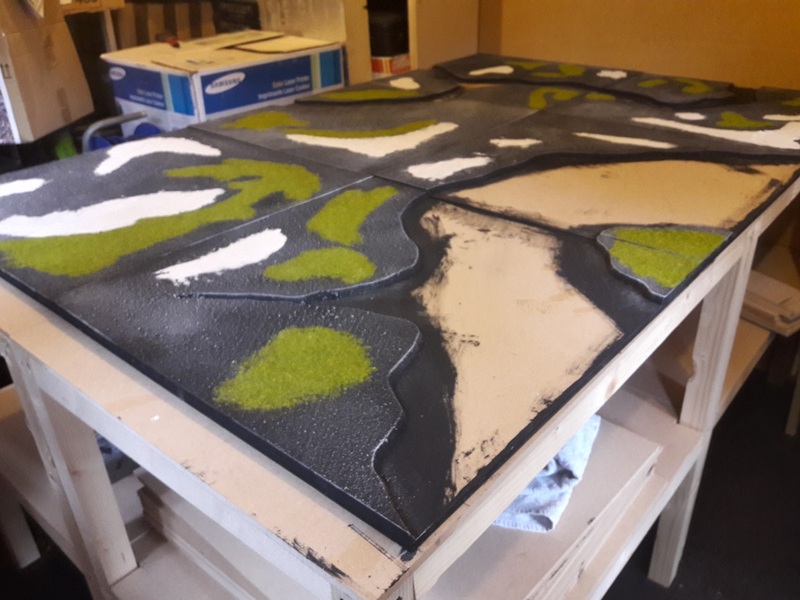 I've not attempted to get the static grass to stand as I will be storing these tiles stacked up in a pile so it would get flattened anyway. 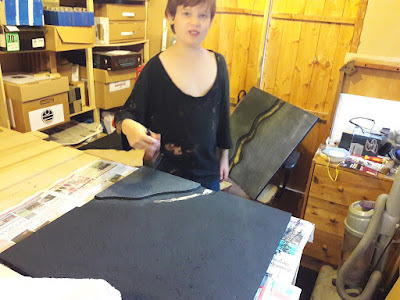 Once that was done, we painted on some more PVA and then added snow (Bicarbonate of Soda from the local supermarket). 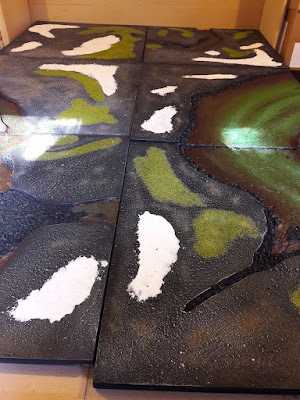 Once all was dry, I mixed up a 50-50 mix of PVA and water in a spray bottle and gave the whole table a series of three heavy spray coats to seal everything down, leaving 24 hours between each for the previous to dry. I'm getting there! 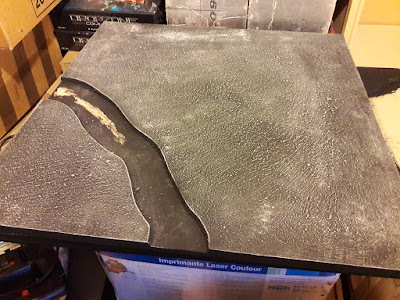 I will add more to these surfaces shortly, but I'm itching to get stuck into the water features next. With the first half of the tiles for the wargames table complete (there will be 14 tiles all told, I've built the first 7 so far) it's time to add some texture. 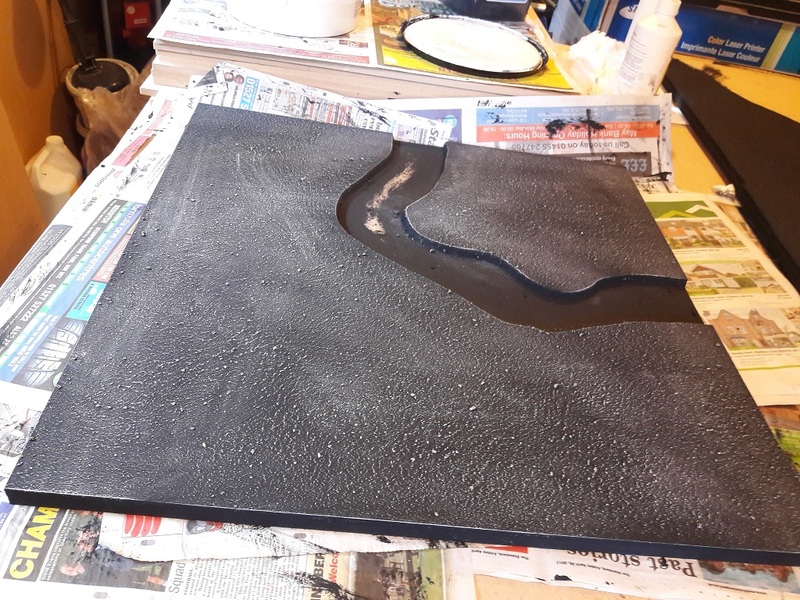 For this stage I've mixed up some black emulsion with some PVA and sharp sand and brushed it on. 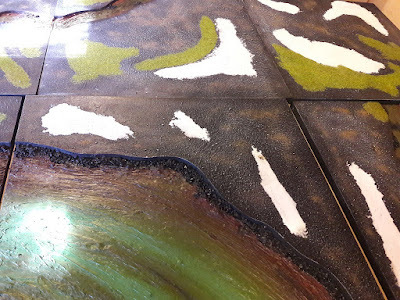 Applying the mixture is a matter of not brushing too hard (don't want to leave brush marks) and not too gently (also don't want big globs of sand that models will not stand flat on). 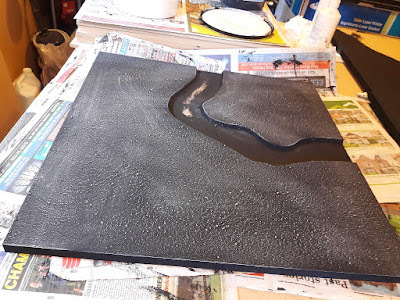 Once this has dried I can go over it and pick off any bits of gravel that are too large. We've made a start on building one of the major water-features for our wargames table - the modular beach. Both of the above images show the tiles as "end pieces" placed on the short edge of the table, but they will work just as well placed along the long edge of the table. This tile has another sneaky feature. 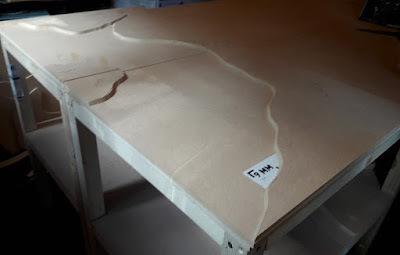 Remember that I'm intending all of these to work as double-sided tiles; if you flip this one over you will find that there's a lake cut into the baseboard (concealed in the upper right of the picture).